What makes eating fun? Of course, there’s taste of the food. The smells and aromas also definitely make a difference. And, last but not least, there’s the texture. Think about it: where does the beauty of a Hanoian bowl of bún chả come from? Sure, there are the flavours: the smoky tang of the grilled pork meat and the sour hint to the broth. They just perfectly harmonise. But what’s more, there’s the pleasant chewiness of the meatballs, the crunch of the fresh lettuce and the deliciously marinated pieces of young mango and carrot. Overcook it and you’ll spoil it. 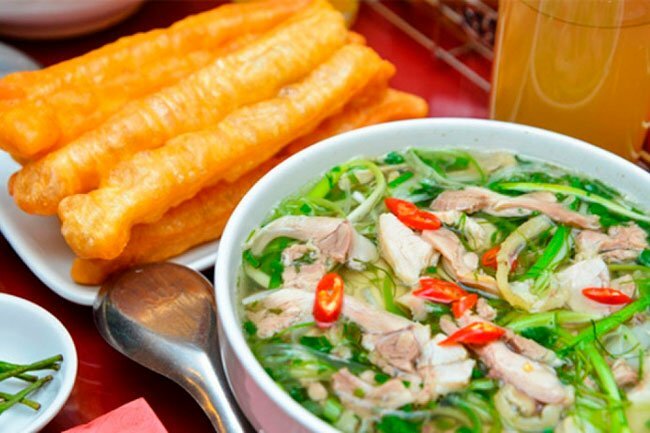 The importance of texture in Vietnamese cooking traditions simply cannot be overrated! Vietnamese cuisine is all about balance⇓—of flavours, of colours, of nutrients, of yin and yang. Its elements are meant to complement each other in every sense, and the mouthfeel takes centre stage in this symphony. It’s “the delivery mechanism for flavour”, as the Californian restaurateur Daniel Patterson said. Food is supposed to feel as good as it tastes, and this is not done by mixing up the same textures. Variety is key. When ingredients are too similar in consistency, none of them stands out. Vietnamese chefs have understood that. Central Vietnam, for instance, loves its rice crackers. Why so? Because they’re crispy. John S. Allen, scientist at the Dornsife Cognitive Neuroscience Imaging Center and the Brain and Creativity Institute at the University of Southern California, claims that we’re all crazy for crispy by virtue of evolutionary legacy. And can we deny it? 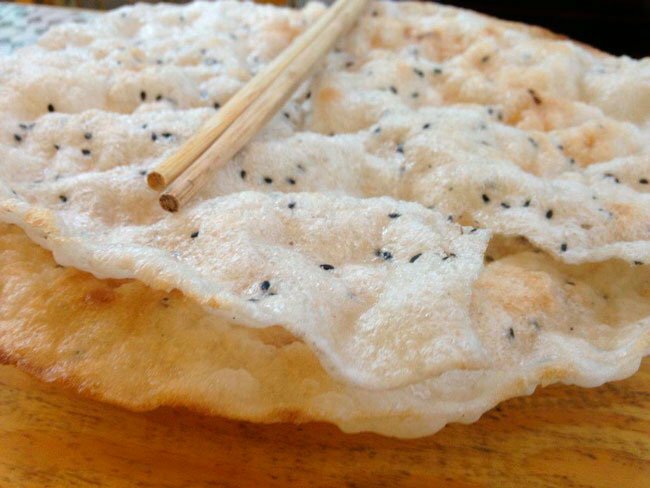 In Central Vietnamese cuisine the rice crackers’ crispiness first and foremost adds to the delightful mix of textures. In a proper mì quảng, the tagliatelle-shaped rice noodles are still firm to the bite, the pork and/or (when in doubt, always pick ‘and’!) shrimp add a springy note, the greens and peanuts give it the occasional crunch, the intensely flavoured broth is slightly thick—but it’s the crumbled-in rice crackers that round it all out. It just wouldn’t be the same experience without them. As Allen said, the rice crackers’ crisp “enhance[s] the sensory experience of eating” because they stimulate yet another sense involved in any food experience: the hearing. Take them out or let them soak up the broth too much and your bowl of goodness will only be half as good. Down with the Culinary Preconceptions! Western and Eastern cuisine clearly have different approaches to texture. While creaminess is something you rarely find in Vietnamese food, no Western dish will ever beat Vietnamese stickiness. Case in point: glutinous rice and mung bean paste. The majority of local desserts is based on the simple principle that sticky food makes your mouth water in the truest sense of the word. But Vietnam wouldn’t be Vietnam if it didn’t manage to add a counterpoint. 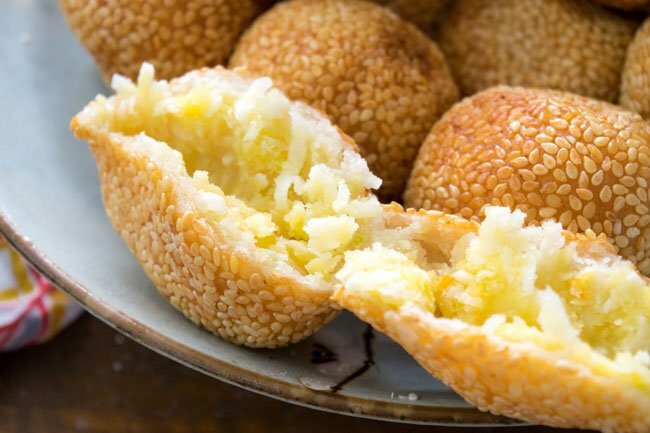 The chewy-gummy consistency of the mung bean core of bánh cam (sesame balls), for instance, is complemented by deep-frying the balls to produce a crunchy surface. 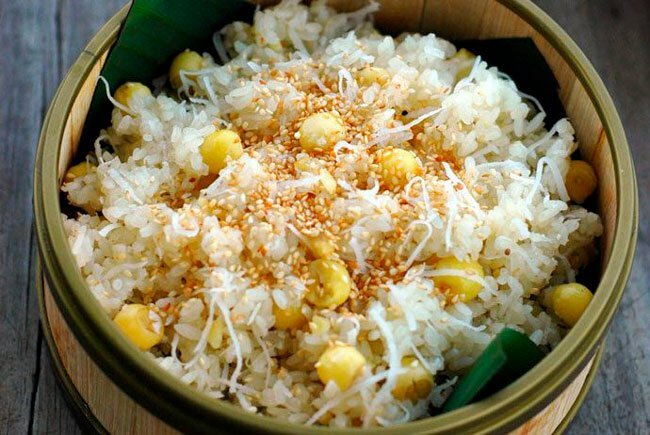 For the same reason, the classic Lunar New Year dish bánh chưng (sticky rice cake) is best fried right before you eat it (and then dipped in salty soy sauce). And hasn’t every Vietnam traveller who has tried đậu hũ dồn thịt sốt cà chua (pork-stuffed tofu in tomato sauce) wondered how on earth you can mix tofu and meat together? The answer is simple: you just need to abandon your preconceptions about food pairings. As long as the elements form a harmonious whole (like the mushy tofu and the firm meatballs), go ahead and combine! This is a lesson to learn from Vietnamese cuisine. However, from North to South, Vietnamese have a changing approach to food that, broadly speaking, goes from puritan to “everything goes”. 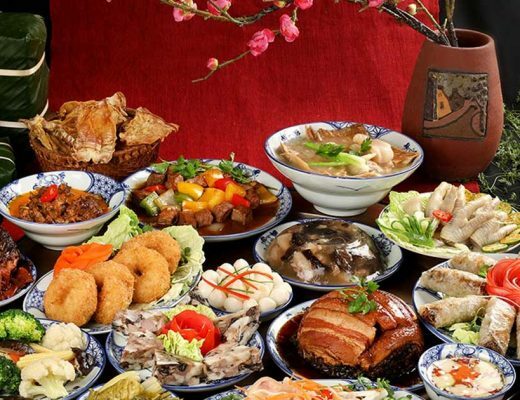 In the country’s capital of Hanoi, the dishes are more straightforward, the flavours more pure. A phở is a beef broth with rice noodles and beef cuts, period. But the Hanoians too have their little textural additions, such as the sometimes crunchy, sometimes soft fried bread sticks (bánh quẩy), and minced green onions. So here you have something that is clearly more texturally diversified than, say, spaghetti with tomato sauce. 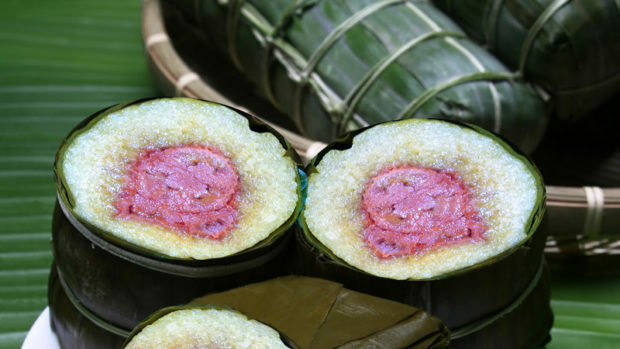 The southern and central parts of Vietnam, however, are much more generous regarding the ingredients used. 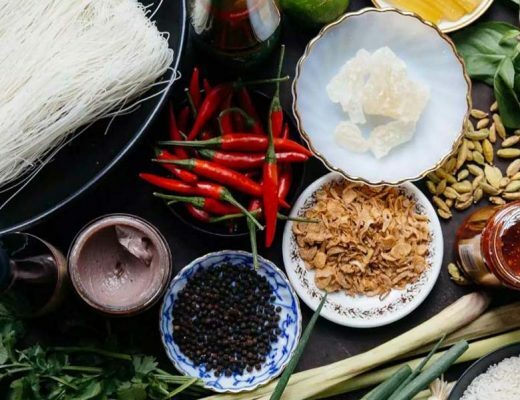 A phở without greens is incomplete to a true Saigonese, and many will claim that the secret to Vietnamese cuisine lies in the herbs. This is, of course, a biased judgment that cannot but come from a southern-spirited mind. But it is true that this lavishness in cooking naturally makes for more varied compositions. If I get bean sprouts with my phở, I’ll definitely throw them in. For texture’s sake! Lastly, we have to talk about the somewhat-startling preference of the Vietnamese people for… special textures. 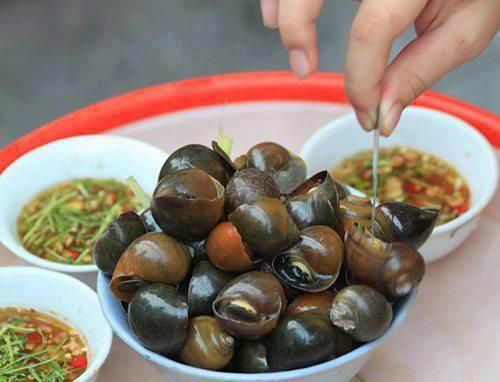 Any foreigner who has fought their way through a potful of pork knuckles, with their smooth, yet hard-to-chew fat will know: Vietnamese like it slimey. 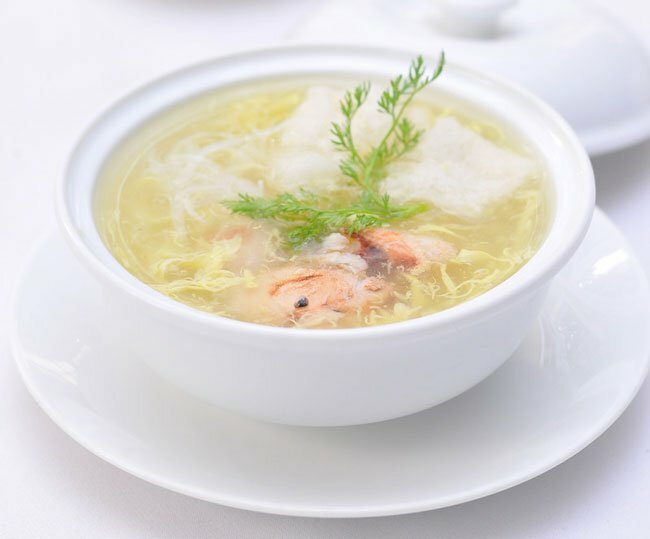 I mean, has anyone here tried the wedding classic súp cua (crab soup) or been treated to a bird’s nest (yến sào) by a well-meaning Vietnamese friend?? Very true. We’re all preconditioned when it comes to food. Therefore, the first step to truly exploring Vietnamese food is to surrender to its exotic world of rarely felt textures. Nice Article! Textures make many Vietnamese dishes a popular choice here that often come across very strange for foreigners. I think its a fun experience for many travellers to try these different texture combinations that come off so strange. Most of these strange textures are most likely not available in Vietnamese restaurants around the globe so something you need to come to Vietnam to experience.